Description: This course is for individuals with responsibility for maintenance of medical gas and vacuum systems in health care facilities and laboratories. This is a 32-hour training course including a written examination. The fee for this course is $350.00. General Knowledge: Identify and show knowledge of applicable laws, rules, codes, listing agencies, and federal and state regulations. Product Performance: Identify the major components of medical gas and vacuum systems, and operating principals. Product Maintenance Knowledge: Identify and describe proper maintenance requirements for medical gas and vacuum systems. System and System Component Testing: Test procedures for system components. Documenting and Recording: Identify location of equipment and report on status. Prerequisites: Individuals must be employed by a health care facility or laboratory with a minimum of one (1) year of medical gas and vacuum piping experience. To provide minimum performance criteria for medical gas and vacuum system maintenance personnel, to assure compliance with industry standards, federal and state regulations. After the applicant has successfully completed the 32 hour course and written examination, he/she will be issued an "Active" P.I.P.E. 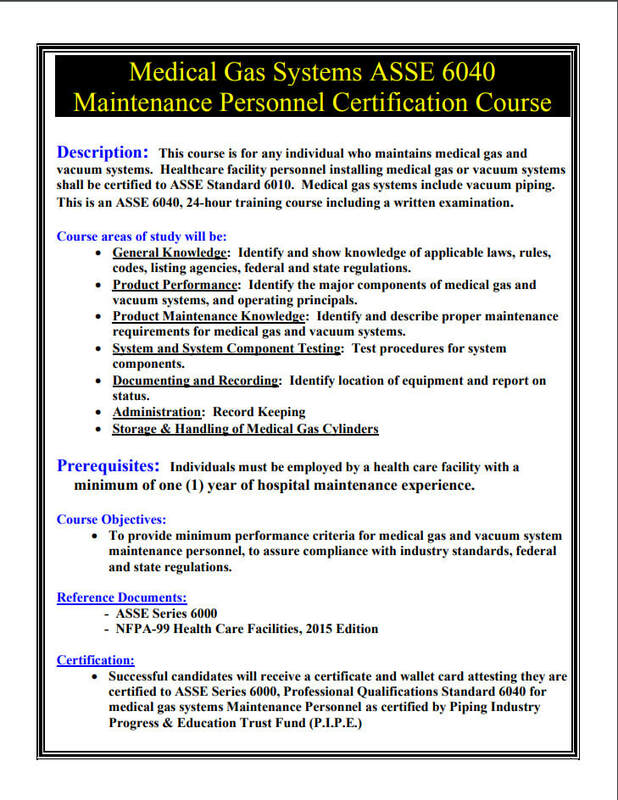 Medical Gas Maintenance Personnel Certification, and ID card.